April | 2007 | The S.E.E.P. Maple Syrup gets Even More Vegetarian! We all love the guilty sugar-laden pleasure of watching sweet, organic maple syrup run down over the edges of our breakfast carbohydrate cakes. I personally like to cut my pancakes up first, then use some of the pieces as a dam to keep the syrup in one corner of the plate for dipping. 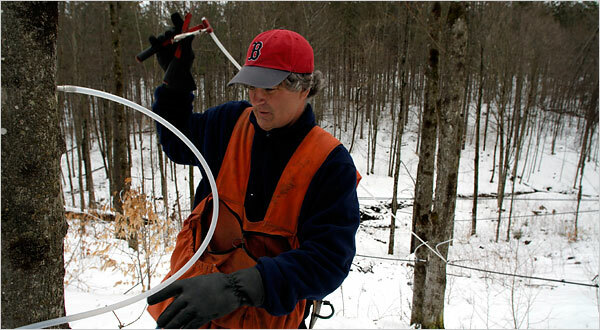 We all add our own style and panache to our use of the liquid gold, but a Vermont syrup farmer Dan Crocker, owner of Sidelands Sugarbush, has added an eco-friendly style to his maple syrup. It seems that even the syrup farmers are seeing the effects of global warming as well, losing 3 days, or 10 percent of their narrow 30 day harvest period over the last 40 years. Although the industry is relatively environmentally friendly, the distillation process requires heat, which traditionally requires fuel oil. Mr. Crocker, with the aid of an $8,900 grant from the Dept. of Agriculture’s sustainability program, has converted his fossil fuel-fired heaters to vegetable oil! Even in the harsh winter of Vermont, he is able to start up the burners on regular oil, then switch over to burning waste vegetable oil to process the sap into yummy VT maple syrup. The Pope Wants You to Recycle and Preserve the Earth! Well, I hate to say I told you so, Reverend Robertson and the other evangelicals with a right-wing Christian stranglehold on middle America, but the Pope, yes the terrestrial right hand of the Catholic God himself, believes in global warming! At a Vatican conference on Climate Change on Thursday, Pope Benedict said that we need to “respect creation” while “focusing on the needs of sustainable development”. It seems that common sense, reason, and forward thinking are indeed characteristics that some branches of religion can still possess. In case you haven’t heard, the majority of American evangelical ministers have come out publicly against our scientifically confirmed global energy and environmental crises. They cite various reasons for this stance, including the inherent distrust of the scientific process, the concern that putting our energy towards environmentalism is “taking our focus away from god”, plus the brilliant concept that since the apocalypse is coming, it doesn’t really matter what we do to the planet! I still really cannot fathom how supposedly free-thinking Americans can buy into these evangelical brain-sucker schemes. All you have to do is a minuscule amount of research and it becomes painfully obvious how backwards some of these ministries are. Have you seen the movie Jesus Camp? Wow. Frightening to say the least. While I am not religious in the least, ascribing to the “science as god” theory of the universe, and firmly convinced that all religions are simply varied attempts at explaining the world’s and human existence, where we go when we die, and building moral frameworks, I am elated that we are seeing some sort of environmental leadership from the Catholic Church. If we can get the followers of the silver diviner who was convicted of fraud then found golden tablets with scripture in the hills of upstate NY, reading them with “magic glasses” (which he lost then had to use “seeing stones” in a magic hat) to step up towards environmental stewardship, we might make some progress with the conservative religious side of our country! Coca Cola may be a decent stock option for financial reasons, but they are a poor choice for ethical reasons. Unethical investment choices these days, often play out to be poor financial choices as well, especially with the rising awareness of global warming, waste, and fossil fuel use. Coca Cola, although they have recently pledged to reduce the pollution and water use from their Atlanta facility, have singlehandedly caused entire towns in 3rd world countries to be without water for crops and has left toxic waste in their factories’ wakes. The consumer beverage industry as a whole is an environmental catastrophe. Billions of gallons of water are diverted from agricultural use for it’s production, even in India and other 3rd world countries where water is scarce to begin with. Toxic chemicals are produced, then the processed, sugary concoction is packaged in aluminum or plastic and shipped long distances, using even more fossil fuel. Coca Cola’s Dasani water brand is an excellent example of consumer waste wherein tap water is passed through a reverse-osmosis filter, packaged in plastic (parts of which are leeched into the water in the bottle), and shipped far away, so that people can drink the same water that they could get out of their tap, leaving a trail of unnecessary waste and fossil fuel use. Financially, I would be willing to bet that with environmentalists such as Lester Brown discussing the drawbacks of using bottled water, especially in America where tap water is safe to drink almost everywhere, the Dasani branch of Coca Cola will likely lose significant value in the coming years. We have already seen 7up changing to “natural” ingredients and because of the “mainstreaming of green” and increased consumer awareness, we very well may see a slow decline in the mass-produced consumer beverage industry on a whole. Home Biodiesel Production now in the Black! Well, after 1 1/2 years, we’ve made 540 gallons of biodiesel in our appleseed processor and driven somewhere north of 13,000 miles on this renewable, CO2 neutral fuel. We’ve spent $1670 to build the processor, wash tank, storage tank/fueling station, a small shed to house it all, and the methanol and KOH needed for the process. With the current batch of homebrew B100, our total cost per gallon will be $3.09, now under the market price for dino-diesel. From here on out, the basic costs will be around $1.00/gallon for biodiesel and $0.25/gallon for filtering used vegetable oil. We currently have a Jetta TDI at 43mpg and by next month we’ll have the ’87 Westy Syncro TD Vanagon running biodiesel with a vegetable oil conversion getting an estimated 28-30mpg. Assuming that we drive a combined 15,000 mi/yr and take into consideration mileage, we’ll spend $269 on biofuel as opposed to $1394 for fossil fuel, saving $1125, reducing our cost by 80%, negating the CO2 emissions, and no longer require foreign or domestic petroleum. Granted, it takes time to do all this, but now that I have the process fairly wired, it takes less than 3 hours for a batch of 30 gallons. I officially consider our biodiesel experiment a success! At the very least, we’ve broken even, decreased our fossil fuel use, and learned a ton. Plus, from here on out we’ll be saving money as well as being part of the solution not the problem. Seek out biofuel options in your area! X-tracycle Sport Utility Bike Operational and Saving Gas! As promised, I recently built an S.U.B. (Sport Utility Bike) from some new parts, a slick retro CamelsBack frame from NYCbikes, some used parts, and an xtracycle freeloader kit. I’ve been riding it to work and around town here and there for errands and I must say, it is a joy to use. I carry a notoriously stuffed and heavy Patagonia Critical Mass messenger bag which is somewhat unwieldy over the shoulder on a bike, but barely noticeable nestled in one of the Freeloader bags on the xtracycle. The other day I had a 20 lb bag of dog food on one side and a big box on the other and I hauled up a hill to our house without a problem. I haven’t yet taken it for the 18 mile trip to Shell Beach yet for a surf, but I have the Longloader attachment ready to go! The guys at xtracycle are enthusiastic and helpful, they are planning an xtracycle road trip with their band, The Ginger Ninjas, from San Francisco to Mexico. The Green Guide for Healthcare is “the healthcare sector’s first quantifiable sustainable design toolkit integrating enhanced environmental and health principles and practices into the planning, design, construction, operations and maintenance of their facilities.” The program began in 2002 and version 2.0 of the guide was released in 2004, offering L.E.E.D. (Leadership in Energy and Environmental Design) guidance and is anticipated to be compliant with L.E.E.D. certification for healthcare in late 2007. This seems to be an excellent resource for both new healthcare construction as well as making your existing hospital or clinic more environmentally friendly. In the ER we see an incredible amount of waste and the trend in healthcare has been towards single-use disposable products, not to mention the energy-intensive and wasteful design of most hospitals. Anyone in healthcare should take a look at this and at the very least, send a copy (preferably electronic) to their hospital CEOs or Environmental committee to review and get the conservation started! Chevy’s Greenwashed Microcars at the NY Auto Show – No Innovation or Ingenuity. Bonus – "New Car Buyer’s Guide"
We don’t care what your cars look like as much as we care how we can use them and minimally impact the environment. We want a 75mpg convertible 5 seater that runs on vegetable oil. We want a sweet sportsbcar like the Tesla Roadster that beats a Porsche off the line, is all-electric, and goes 250 miles in one charge. We want to be proud of how we are using our resources and proud to use an American engineered and American-made car on alternative fuels. I will admit, however, that they look pretty darn slick. This was my response to a blog posting on the GM Blog, fastlane’s “proud birth” of their pseudominicar triplets. They tout innovation and design, yet barely mention the innards of these smallish new concept cars. This is yet another failure in a long line of poor decision making and a stubborn partnership with the U.S. oil industry, as we have yet to see an American car company design and sell an environmentally friendly car. We know they can do it, we’ve seen and become nauseated at the waste shown in “Who Killed the Electric Car?”. We’ve seen Toyota make huge profits on the Prius, outselling all American counterparts. We’ve seen small startups but out incredibly advanced, efficient, and practical (for a rich speed junkie anyway) sportscars like the Tesla roadster and now the L1X-75 that will appeal to plenty of earth-loving yuppies. We know that it can be done, we know that a profit can be made, and we know that U.S. automakers have way more resources than all of these startups put together! So why won’t they jump into the CO2 neutral arena? Why won’t they offer a line of electric and alternative fuel burning cars? The car makers of our country try to instill pride in an American -made vehicle yet they sue our government when it tries to impose fuel efficiency standards weaker than Europe’s. It makes no sense and I think that we should boycott all U.S. as well as foreign automakers and refuse to buy any new car until they begin selling an environmentally friendly personal vehicle. 1. No fossil fuels – this means an all-electric car with a hydrogen or solid battery, a hybrid with a biodiesel or ethanol fueled motor, or a straight alternative fuel engine rated to run on biodiesel, ethanol, vegetable oil, or another burdgeoning biofuel like butanol (which will run in any gas-powered vehicle without modification, btw). 2. Cradle to Grave certification – The parts for our requested vehicle should be made of bioplastics or be recycled and recyclable and it’s useful life should be long and reliable. 3. Efficient – Not only are avoiding fossil fuels important, but an inefficient alternative-fueled vehicle can cause plenty of waste as well. Gone are the days of selfish, compensatory Hummers driving kids to school. We need to evolve into more resource-conscious and responsible consumers. So, you’re a looking for a new car? Here’s the front and the back of The S.E.E.P.’s Official 2007 New Car Not Buying Guide! Print them out and place them in your favorite car dealer’s info rack! Rule #1 of the guide is: Don’t Buy a New Car.